Whether you're a new or seasoned group leader, or whether your group is well-established or just getting started, the Making Your Small Group Work DVD and participant's guide (sold seperately) will lead you and your group together to a remarkable new closeness and effectiveness. Designed to foster healthy group interaction and facilitate maximum growth, this innovative approach equips both group leaders and members with essential skills and values for creating and sustaining truly life-changing small groups. Created by three group life experts, the two DVDs in this kit include: * Four sixty-minute sessions on the foundations of small groups that include teaching by the authors, creative segments, and activities and discussion time. * Thirteen five-minute coaching segments on topics such as active listening, personal sharing, giving and receiving feedback, prayer, calling out the best in others, and more. Formerly titled ReGroup. 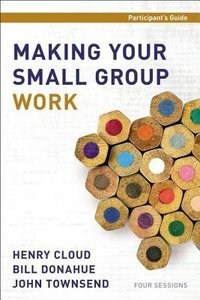 About "Making Your Small Group Work (Participant's Guide)"